Our next project will use an external 12-18V power supply. It will be again a Raspberry Pi powered device. Having an additional 5V/1A power supply in addition to the main 18V power supply is not really a nice solution. Therefore we want to create this 5V power supply from the 18V supply. 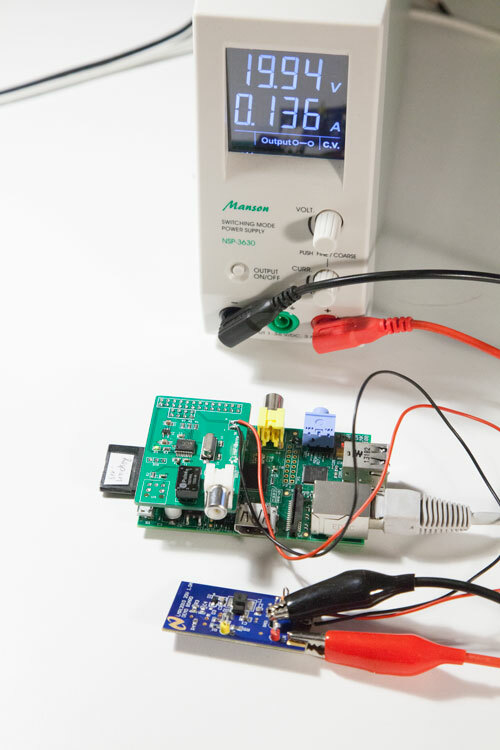 As the Raspberry draws 500-1000mA current, a simple linear regulator is not an option. It has to be a switching regulator. The LMR12010 from Texas Instruments (formerly National Semiconductors) seems to be an interesting chip. It does not need many external components, but still has an acceptable efficiency. There are chips with better efficiency, however these usually need external switches. Today we tested the chip using the Evaluation kit from TI. Interestingly, the Eval kit still has the National Semiconductor logo on it. The result looks promising. The efficiency is good enough, no additional heat sinks or cooling for the switching regulator is needed. This entry was posted in Projects and tagged electronics, power supply, voltage regulator on March 5, 2014 by Daniel. Does the LMR12010 demo board outputs 1.8V/1A is ok for per raspberry pi input 5V/1000mA? No, you have to modify the board to output 5V and work with 18V input. Thanks a lot, another question, where did you get this amazing manson NRP-3630 :) ? This Manson is not the best power supply in the world, but I like it because it is relatively smalI and cheap. I got mine from Reichelt.de. Could it be modified for psu putting out 30-50v rails? No, this will only work up to 20V. There are only a few regulators available on the market that work with 50V. What modification was done to the board for the 5V output? I am also interesting about the Vboost configuration. Did you used, Figure 12. VBOOST Derived from Series Zener Diode (VIN), and what was the R3 value?